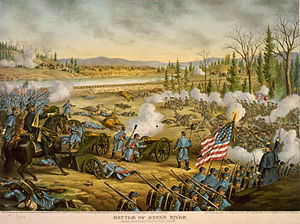 Driving home last night, I heard a local historian on WDVX radio telling a story of the Civil War Battle of Stones River, near Murfeesboro, TN, not far from Knoxville where I live. This story for me seems metaphoric of the particular horror of Civil War, the heart pain of watching two brothers fighting. The battle engaged 76,000 soldiers (“effectives,” is the term Wikipedia uses). This was New Years Eve, 1862, a cold night before certain battle. With the armies camped only 700 yards from each other, Union and Confederate bands started a musical war: “Battle Hymn of the Republic” against “Dixie”; “Hail Columbia” and “Yankee Doodle” against “The Bonnie Blue Flag.” Each camp tried to out-sing and out-play the other until one struck up “Home Sweet Home.” Now all the soldiers, North and South, sang. Nearly 80,000 voices. In 36 hours, said the historian, more than 18,000 would be killed or wounded. With soldiers captured or missing, more than 24,000 casualties. So many boys missing home.